Newport Beach is home to dozens of highly skilled and passionate plastic surgeons. We gathered up some of Newport’s best and left it up to you to choose the city’s top 7 surgeons. Their dedication to their patients and talent in the operating room positively impact hundreds of individuals from the inside out. Find out what got them started, how it feels to be voted one of our readers’ favorites, and what they love to do outside of the office. 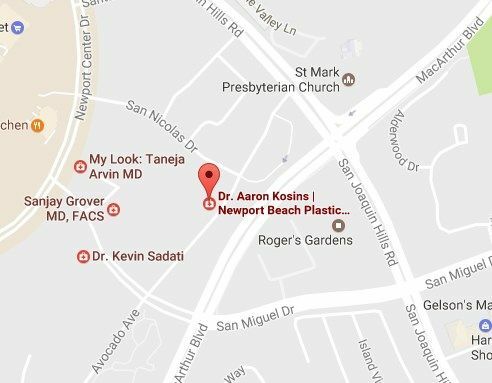 Aaron Kosins: The most rewarding aspect of being a Plastic Surgeon is getting to see the results of my work and creativity on a daily basis. I get to see patients after surgery, and the newfound confidence is overwhelming. In my practice I specialize in rhinoplasty. I love this operation because it can really change a young person’s life. Seeing my patients come in with a big smile and new energy makes me feel good inside every time. Unlike a lot of professions where you may only get a “win” every few months, as a physician we often get them every day. Q: What inspired you to become a plastic surgeon? AK: When I was in medical school, Plastic Surgeons were the most skilled surgeons I worked with. On my first day rotating on the Plastics service, I saw them use a man’s fibula (leg bone) to make him a new jaw. They disconnected the leg bone with its blood supply and reattached it in the neck. I thought, “I want to do that!” And the first time I saw a rhinoplasty, I knew that would be my lifelong passion. The operation itself is the most difficult operation in Plastic Surgery, and every nose is very different. Making a nose fit the face and look elegant is very difficult, and so I have dedicated my career to doing that. Q: Do you have any other passions besides your profession?